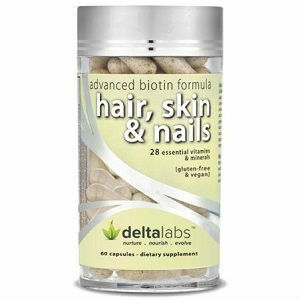 This is a review of Delta Labs Hair, Skin, and Nails. This product is meant to help consumers grow stronger and healthier hair, skin, and nails. They claim that a person taking this supplement as directed will see results within 30 days. Keep on reading to see if this supplement is ideal for your needs. 5000 mcg Biotin to promote and support the growth of healthy hair. 200 mcg Folic acid to also promote healthy hair, skin, and nails. 100 mg Calcium to fortify nails. This supplement states it is also gluten-free and vegan, which means that almost all consumers (unless allergic to a certain ingredient listed) can consume this. The manufacturer recommends the consumer to take 2 capsules daily with meals. Due to the inclusion of iron, this is not recommended for children. Women who are pregnant or nursing should not take this supplement. The label also warns to consult a doctor if you are currently taking other medication. The price of this product on its website is $19.95. The Manufacturer’s Suggested Retail Price is $39.95. There are 60 capsules per bottle and while this is reasonably priced, it is slightly more expensive than some other supplements that promise to do the same thing. There is no mention on the site of an auto-renewal plan. The website also does not provide customer reviews or feedback which can leave potential new consumers leery of purchasing this product. The manufacturer will give the consumer a full refund if the product is returned within 30 days after it was purchased. The company specifically states that it must have the item physically before the 30 days is up along with its original packaging, invoice, the consumers personal information, along with a reason for the return. It must be noted the company also specifically states the item has to have been used as directed in order the consumer to get their refund. While it is a good thing the company provides the ability for a refund, consumers may find the process to be a hassle. Delta Labs Hair, Skin, and Nails claims to be manufactured under the GMP strict guidelines and also is certified by the NSF. Along with its high standards, this supplement lists all its active and inactive ingredients and is stated to be both vegan and gluten-free, making it accessible to large group of people. The company states the product will show results (if taken as directed) within 30 days, which is enough for one bottle. The strict guidelines and rules of the money back guarantee may prove to be a hassle to the consumer if they are not satisfied with the product. It is also disconcerting that the link provided to contact the company provides no email address or information. This may be a sign of bad customer service. This supplement can be for you if you are interested in improving your appearance and as well as your overall health. With the ability of being able to get a refund, it can be the ideal supplement for you. John Brownstone	reviewed Delta Labs Hair, Skin, and Nails	on July 28th	 and gave it a rating of 3.